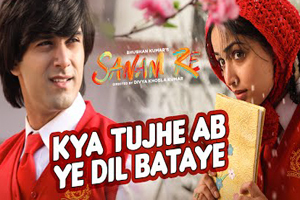 Hindi Lyrics 4 U: Lyrics Of "Kya Tujhe Ab Ye Dil Bataye" From Latest Movie - Sanam Re (2016). Lyrics Of "Kya Tujhe Ab Ye Dil Bataye" From Latest Movie - Sanam Re (2016). A love song in the voice of Falak Shabir and music composed by Amaal Mallik. Star Cast: Pulkit Samrat, Yami Gautam, Urvashi Rautela, Rishi Kapoor. The audio of this song is available on YouTube at the official channel T-Series. This audio is of 5 minutes 37 seconds duration. Lyrics of "Kya Tujhe Ab Ye Dil Bataye"
Lyrics in Hindi (Unicode) of "क्या तुझे अब ये दिल बताये"